"Have you lived a life without purpose?" 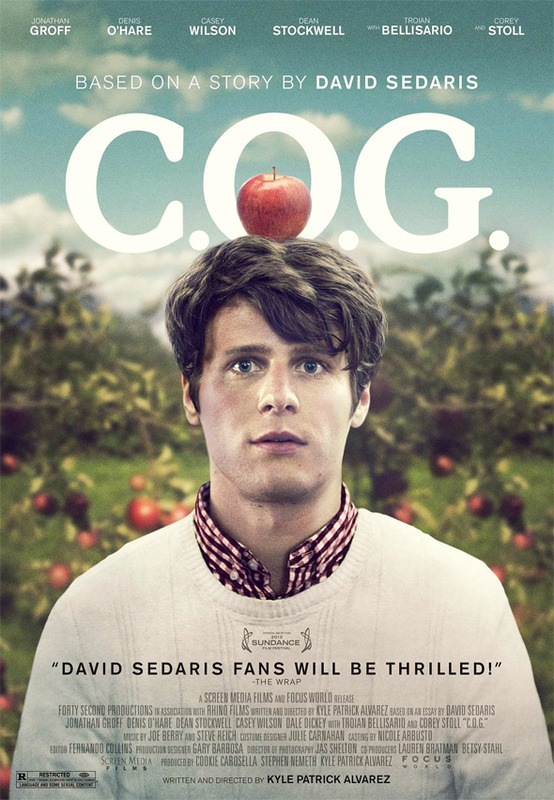 I'm happy to post the first trailer for one of my favorite Sundance films this year, titled C.O.G., adapted from one of author David Sedaris' short stories. It also stars one of my favorite up-and-coming actors Jonathan Groff, best known for his stage work and "Glee" appearances, who shows a whole other side in this outstanding film. In addition to Groff, the supporting cast includes Denis O'Hare giving one of the best performances of his career, plus Corey Stoll, Troian Bellisario, Dean Stockwell & Casey Wilson. Give this film a chance, it's a thought-provoking and refreshing story. David (Groff) has it all figured out. His plan—more a Steinbeckian dream—is to spend his summer working on an apple farm in Oregon with his best friend, Jennifer. When she bails out on him, David is left to dirty his hands alone, watched over by Hobbs, the old farm owner and the first in a series of questionable mentors he encounters. First there's Curly (Stoll), the friendly forklift operator with a unique hobby, and then Jon (O'Hare), the born-again rock hound who helps David in a time of need. This first film adaptation of David Sedaris' work tells the story of a prideful young man and what's left of him after all he believes is chipped away piece by piece. First premiered at Sundance (my review). In select theaters September 20th. Above is the final release poster for the film, hitting theaters this fall. I wrote in my festival review: "I know this is a movie that will continue to stick with me well beyond Sundance, and for all the right reasons, too." I really hope this isn't some moralistic story about how we should all be Christians. In any case, I have spotted a Cylon. No one is what they seem. Lol I hope it isn't either Manon @ CMR.